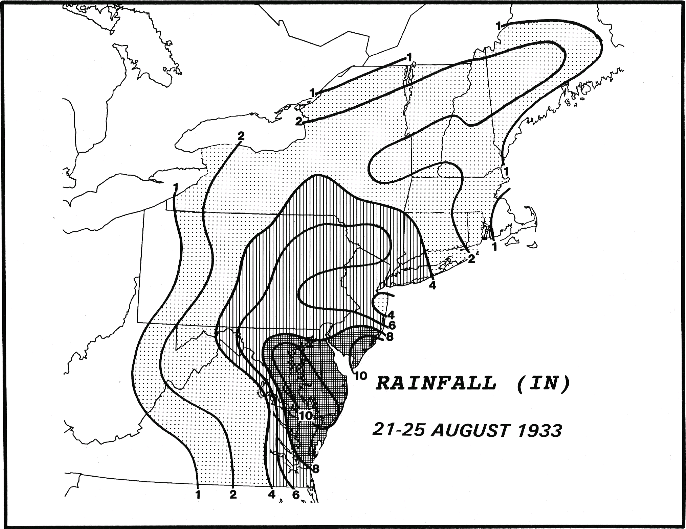 (Wikipedia) - The 1933 Chesapeake-Potomac Hurricane was the 8th storm and third hurricane of the very active 1933 Atlantic hurricane season. The August storm formed in the central Atlantic, where it moved west-northwest. Aided by the warm ocean waters, the hurricane briefly reached Category 3 status on the Saffir-Simpson Hurricane Scale before making landfall along the Virginia/North Carolina coast as a Category 1 storm. The hurricane caused severe damage along the East Coast of the United States. The state hardest hit by the storm was Virginia, where the center of circulation passed directly over Norfolk.... In Washington, D.C., the storm produced a storm surge of 11.3 feet (3.4 m), rainfall of 6.18 inches (152 mm) and winds of 50 mph (80 km/h). 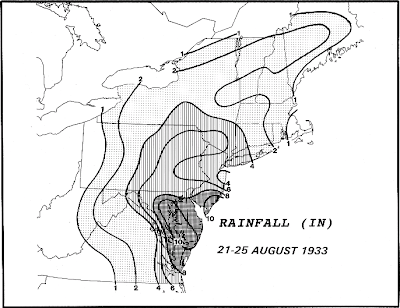 In Maryland, the hurricane caused $17 million dollars (1933 USD, $230 million 2005 USD) in damage to crops and buildings. The storm also destroyed a railroad bridge heading into Ocean City and created the Ocean City Inlet between the town and Assateague Island. The storm killed 13 people and 1,000+ animals.